The Guardian® Padded Drop-Arm Commode is designed to accommodate lateral transfers. Cantilevered arms drop with just a push of a button, allowing unrestricted left-to-right leg movement for easy transfer. Deluxe features and heavy-duty construction make this the perfect choice for long term use. Designed to accommodate lateral transfers. Arms drop with a push of a button for unrestricted left-to-right leg movement. Foam handgrips won't slip, even if wet. Backrest can be removed for use as an over-the-toilet safety frame. Pail, lid and splashguard included. Functional. Safe. Easy To Install. Lightweight. Sturdy. by blondie from Kansas City, Mo. The instructions for assembly contained no information on how to attach the seat. I called your company and spoke to a woman named Ariello. She tried but could not give me the info. Said your company wouldcall the next day with instructions. You never called. Risking damage to the product I unscrewed the seat clamps so the seat could be attached to the frame . This shoudl have been in the booklet but it was not. Your lack of response was disappointing. Safe. Sturdy. Functional. Easy To Install. Small for 350lb limit. A little narrow. Easy transition from bathroom to shower. Easy to keep clean. Comfortable for pt with padded seat and back. Bucket does not fit well. I did own the model with the transfer bench. It was easier to use and I will probably go back to one when this one gives out (leaning over helps sometimes and one cannot lean in this model as easily). Guardian is the only manufacturer that has the open front, U-shaped seat. I don't understand how all other models expect someone who is nonambulatory, who cannot use their legs, is expected to reach their rear-end and service themselves. 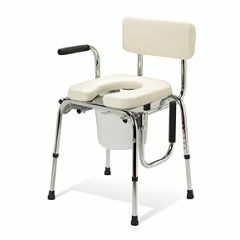 90-95% of the commode chair products are useless to an independent wheelchair-bound person. Thank you, Guardian! Safe. Easy To Install. Functional. Sturdy. Difficult to move on carp. Where can I get replacement seat and back? Hopefully the padding has been improved since I bought this one. Can the pail be detached and the frame placed over a toilet? Yes and it includes a "splash guard" which helps direct everything into the toilet while minimizing splashing. It's essentially a bucket without a bottom. How do you attach the seat? There are no instructions for that. Can the padded seat be turned around so that the opening faces the back (to facilitate cleanup by caregiver)?